Understanding how a piece of new technology relates to an organisation is extremely useful. If it's an evolutionary change, replacing something existing - it's pretty straight forward. However it's never been done before then it's inherently viewed as higher risk. In Professor Eddie Obeng’s book All Change! : The Project Leader’s Secret Handbook,he provides a model for classifying projects by type. Eddie introduced an incredibly simple map to allow you to figure it out. I love the idea so much that I’ve extended Eddie’s concept and overlaid project methodologies on top of it. Painting By Numbers are those childhood picture kits where you match the numbered paint colours to corresponding numbered areas on the pre-printed canvas. It’s a very simple, almost foolproof, way to create a painting. Now let's extend Eddie's concept with the question Why. 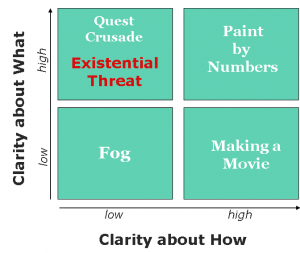 Why is a great strategy question? Why do we want to do this? Answering in the form "In order to ....." can help obtain great insights. Young children sometimes repetitively ask "Why?" - although extremely irritating to adults it can expose deep seated assumptions and bias. As we become adults we unfortunately stop this powerful habit. So asking "Why?" several times can drill down into useful information. Now let's create a new Eddie matrix. So this new matrix maps the Why. It doesn't seem to make a lot of difference if you ask How or What with the x axis. So if you are clear about Why you're doing something and you're clear about what and How then you have a clearly defined strategy. If you are clear about What or How to do something but don't know why, there's a pretty good chance you're following the crowd. For example "we need to move to the cloud". Why? Everyone else is moving to the cloud !! If you're clear about Why but haven't got a clue what to do about it, there's a pretty good chance it's an existential threat. For example "plastic pollution will kill the planet" - it's a pretty clear reason why you want to do something but the human race is unclear What to do about it or How to tackle the problem. Plastic pollution is therefore absolutely an existential threat to planet earth. The fog box is pretty much the same as Eddie's box. 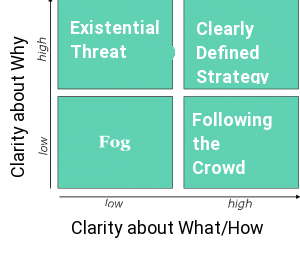 So if you need to do something different to the normal modus operandi then asking Why to get into the Clearly Defined Strategy box is a useful tool.